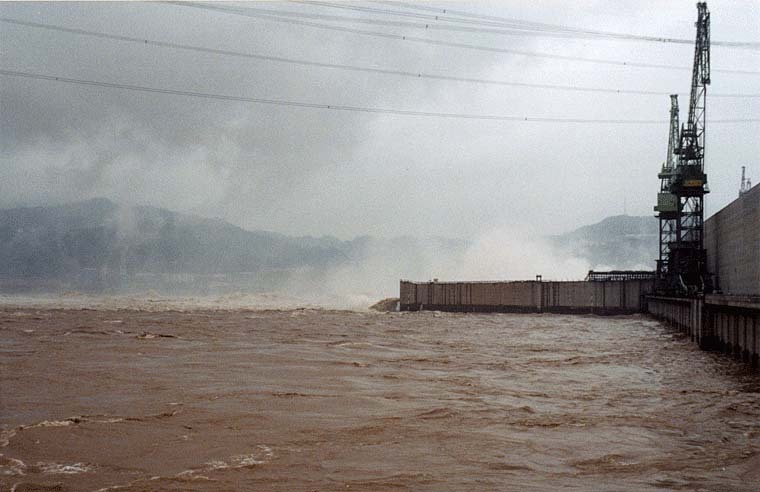 The Three Gorges Dam is a hydroelectric river dam that spans the Yangtze River in Sandouping, Yichang, Hubei, China. It is the largest hydro-electric power station in the world. The total electric generating capacity of the dam will reach 22,500 MW. Six other turbines may also be installed, thus the dam is not expected to become fully operational until about 2012.The dam wall is made of concrete and is about 2,309 metres (7,575 ft) long, and 101 metres (331 ft) high. The wall is 115 metres (377.3 ft) thick on the bottom and 40 metres (131.2 ft) thick on top. The project used 27,200,000 cubic metres (35,600,000 cu yd) of concrete, 463,000 tonnes of steel, enough to build 63 Eiffel Towers, and moved about 102,600,000 cubic metres (1.342E+8 cu yd) of earth.When the water level is maximum at 175 metres (574 ft) over sea level (91 metres (299 ft) above river level) , the reservoir created by the Three Gorges Dam is about 660 kilometres (410 mi) in length and 1.12 kilometres (0.70 mi) in width on average, and contains 39.3 cu km (9.43 cubic miles) of water.The total surface area of the reservoir is 1045 km². The reservoir will flood a total area of 632 km² of land compared to the 1,350 km² of reservoir created by the Itaipu Dam. The Three Gorges Dam reservoir is longer than the 560 kilometres (348 mi) length of Lake Superior, but only 1.1 % of the surface area of the lake (82,400 km²) and about 1/700 of the volume of the lake (28700 cu km).The dam will raise the water level the third time to its designed maximum water level (175 m above sea level) by the end of 2008.